Environment in mind: reduced share of fluorine in a foaming agent enables an almost complete degradation of a foaming agent with no environmental impact. The foaming agent which is used as a filling for devices consists of an additive, a foaming agent concentrate mixed with demineralized water which prolongs the lifetime of a foaming agent for 6 years. The foaming agent in such a premixture is considered biodegradable. 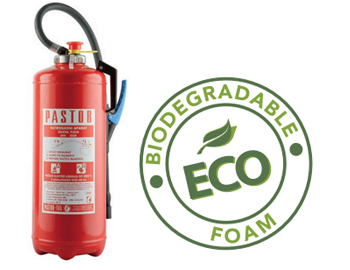 APPLICATION: Foam extinguishers are primarily intended for suppression of initial fires on flammable liquids (class B), combustible solids (class A), whereas cartridge operated foam extinguishers successfully suppress F class of fires (oils and fats of vegetable origin) as well. All portable foam extinguishers are tested and certified to fight inital fires on devices under 1000 V voltage at a distance greater than 1m. 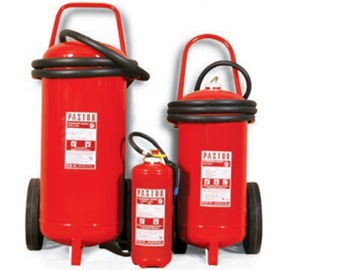 Mobile fire extinguishers are filled with a mixture of foam, water and additives. They are characterized by high model performance and simple use. This product is equiped with a special foam nozzle and a tube length of 5 m.
APPLICATION: Owing to their efficiency, we recommend the usage of these extinguishers in chemical industry, ports, boats, industrial plants, storages of combustible materials and oil platforms.